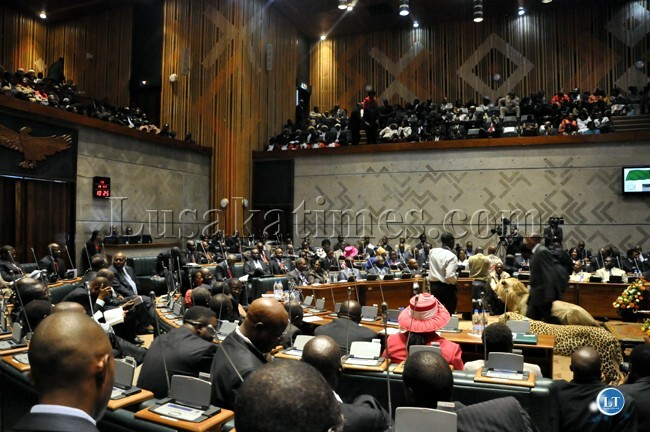 Zambia : MP's and their benefits:whats the way forward? Home Headlines MP’s and their benefits:whats the way forward? MP’s and their benefits:whats the way forward? Ms. Catherine Namugala – Member of Parliament for Mafinga constituency in Isoka – recently stirred a hornet’s nest by proposing an increase in salaries and allowances of parliamentarians. Her basic point is that MP’s do not earn enough to attend to their parliamentary duties and to adequately address the needs of their constituents. The suggestion raised intense debate and prompted largely negative reaction amongst ordinary Zambians. This is not surprising. Many people are struggling to find a job and to put food on the table for their families. They feel that such claims completely disregard their situation. Just so that everyone is clear about this from the very outset, I am personally opposed to any increase in MP salaries at this point in time. However, Ms. Namugala is an experienced politician whose views on this matter should not be brushed aside lightly. In keeping with our issue-based approach as a Party, I will set out what I believe is really at stake in this discussion and offer a way forward in a manner that does not simply politicise the whole debate. (ii) passing and amending statutes (appropriately called Acts of Parliament) as the nation’s key law-making body; and (iii) providing checks and balances by approving constitutional appointments and ensuring that the republican president and his administration govern in accordance with the law. Adding all this up, it is difficult to see how MP’s (many of whom have independent incomes through regular jobs, consultancies or successful businesses), can complain about their pay. One would assume that such a generous package is enough to enable them to attend to family demands and address constituency needs. What is at stake for MP’s? Rightly or wrongly, the electorate in Zambia expect a person running for the office of MP to make personal sacrifices as they discharge the duty of representing their communities. Once elected, however, many MP’s struggle to tour their constituencies and to attend to pressing demands for food, transport money, funeral assistance, school fees, empowerment funds, talk time, house rentals, t-shirts, chitenges and beer (yes, beer). Some MP’s are successful businessmen and can afford to donate their entire gratuity to their constituents as recently demonstrated by the Kasama Central member of parliament, Geoffrey Bwalya Mwamba. For many MP’s, however, it seems that personal and public financial demands are not only never-ending, they create such apprehension that a number of them simply avoid visiting large areas of their constituencies altogether. In my travels around the country, I am constantly told: “The MP has not been here since the election”. Demands on MP’s are indeed heavy, particularly those from remote rural constituencies who have to cover vast and often impassable areas. Because parliamentary benefits are pretty much the same across the board, there is clearly a built-in advantage for those MP’s whose constituencies are within or close to the nation’s most “developed” cities. It is not unusual for MP’s the world over to periodically compare their salaries to MP’s in other countries or to government officials in order to justify proposed increases in pay. But even if MP’s earned 10 times the salaries they currently take home, the demands from constituents would still be too high to be met. The idea that the taxpayer should somehow bear the burden faced by MP’s to attend to the demands of constituents is therefore rather misguided. In my view, this argument misses the whole point. There are three reasons for this. First, an MP should not think he or she can address community needs by getting more pay. This would probably only lead to selective distribution of taxpayers’ resources to cronies of the MP – if in fact any such extra money ever made it into the constituency in the first place. Second, if we accept the principle that MP’s needed more money to help them discharge their functions, not all MP’s should get the same amount since road infrastructure, distances to and sizes of the various constituencies are not the same. Third, if being an MP is so tough, why do they repeatedly contest their seats? What is at stake for ordinary Zambians? The ordinary Zambian just wants to have a chance at a decent life. However, because there is little or no change in a person’s welfare before and after an election, many simply adopt the view that they will extract whatever they can from their MP whenever he or she is available. One of the reasons for introducing the Constituency Development Fund (CDF) was to address community needs identified in the constituency by the constituents themselves through stakeholder representatives. If the concern of MP’s was about the needs of communities, you would expect that they would be advocating an increase in CDF, rather than an increase in their pay and allowances. The fact that they are asking for more pay is an indication that they feel they are not getting what they think they deserve. As part of their role of providing checks and balances, however, MP’s should be able to expose areas where government institutions are not being effective. The pay MP’s earn should therefore ensure that they can properly tour their constituencies. After all, if the MP is not actually getting to all areas of his or her constituency, how will the nation’s law-making body be able to ensure that development is taken to every Zambian? Based on the current take-home pay and benefits, however, it seems hard to argue that MP’S are somehow hampered from playing this role because if poor funding. The biggest concerns with increasing MP pay are what it will cost the nation and how this will improve effectiveness. Assuming each MP is awarded an additional average amount of Kw10,000 per month, this would add a whopping Kw18,000,000 to the annual government expenditure. Given the planned increase in the number of MP’s by an additional 85 constituencies (as well as an additional 8 nominated MP’s) and the tight liquidity in the economy, this will put a severe strain in service delivery and other development programmes, without anything tangible to show for it. We therefore need to think carefully about how we address any demand for increased pay. Parliament should not be another unaccountable distribution channel for aid to communities. MP’s have every right to raise the debate about the challenges they face in meeting the demands of their office. However, they should not complain when people facing hardships in the current economic climate condemn them for seeming insensitive. If the argument is that MP’s need more money to get into and around their constituencies, they should be prepared to introduce a transparent financing mechanism that can allow for the accountability of their constituency travels. This could work through an imprest system where, rather than giving standardised amounts to MP’s for their constituency work, money is instead advanced for constituency travel and the MP brings receipts for the expenditure of fuel and other pre-approved costs. Such a system would, admittedly, create a whole new level of financial administration and is not free of challenges (such as false invoicing and overpricing) but it can be made to work and would allow the nation to address the cry for more pay by MP’s in a manner that promotes accountability without unduly straining the taxpayer. The problem with the MP’s demands is not only about whether they deserve an increase in their salaries to carry out their basic responsibilities; they are also going to find it hard to defend the accusation that they are pandering to the “me first” approach to leadership. Our policemen, nurses, teachers and extension workers all need more money in order to cope with the daily challenges of an economy that is punishing ordinary Zambians with high costs and little or no money in their pockets. Our women and youth need empowerment. Our children need a decent education. We all need better healthcare. Given that over 60 per cent of the national budget is going towards consumption – leaving very little for development – we should not be adding to the consumptive trend but seeking to develop ways of generating greater economic empowerment for everyone. If the MP’s really want sympathy, let them responsibly champion the fight for better living conditions for all Zambians and not only for themselves. Let them fight for our teachers, policemen, nurses, doctors, extension workers, council employees and the mothers and youth on our streets. 23,000 local authority retirees not paid their full terminal benefits. Fat MPs and Thin Citizens, thus PF for you. Plz where is Ba sata, in the event that he is dead who will take over from PF, Since Kabimba is hated by Zambians and his own Party, But the guy and membe are smart see the way they kicked out GBM. Plz PF start glooming someone, the rate at which HH2016 is moving is alarming he has made serious in roads..
Elias Chipimo, be a man enough. If you don’t train you never be strong. Your friends are in Mangango, some even fighting. Why didn’t you join Pastor Mumba just to learn to get dirty? Umwaume ku kalabana yama. Writing those articles will take you no where. Well I can hear you, now, ‘Is that democracy’? why is it that in everything you have to mention HH? do you have a crush on him? i am sorry but i have observed your blogs for sometime now and i think you ought to grow up. please you may not like HH, for which you are entitled, but dragging HH in everything makes me feel like you are taking me back to 2011 when the MMd attacked MCS even for things he wasnt related to. just pause and go through your posting in relation to the article in question and see how HH comes into picture. yet you continually brag that you’re educated. EDUCATED FOOLS are everywhere after all. Thanks. Good Points though Chipimo is a Chongololo (millipede). Why he has failed to wow Zambians is his attitude. He just does not have the leadership qualities that people are looking for. We need leaders who can make Tough Decisions to move Zambia Forward. All these Corrupt MPs should not be given anything as they give nothing to Poor Zambians. Get the Money and give it to Schools / hospitals?? A lot is wrong with MPs benefits this is why they are lazy and extravagant. Why being given 500 liters?? For what? Zambia will never move forward with this rubbish. SATA DIED IN JUNE folks. He is hooked to a machine in Israel at a huge cost to the Zambian people. The government is paying that tourist hospital thousands of pounds per day to keep him in that unconscious state hooked to a machine. I am trying to go Israel soon if it works out. I will try to locate the exact hospital where he is. Plz where is Ba sata, in the event that he is dead who will take over from PF, Since Kabimba is hated by Zambians and his own Party, But the guy and membe are smart see the way they kicked out GBM. Plz PF start glooming someone, the rate at which HH2016 is moving is alarming he has made serious in roads. Wow ! Nice article ! I couldnt agree more. Abash People like Namugala with a “me first” approach. You see Saulosi, morality is addictive, welcome back to reality and good decision making process. Keep it up. The people’s livelihood is in jeopardy here. @Saulosi, you always agree with anybody. If you were a woman you could have been ihule. In Bible and in my village culture its encouraged to first disagree, so you have time to think through the issue. And if you need best advise, ask someone you are sure will disagree, like me, and ague it through. 5. Work out a master plan to increase Zambia’s exports. The rationale put forward by Catherine Namugala as a basis to raise MPs salaries in order to discharge their functions effectively is a misguided and mischievous one. Contending elections has never been easy and cheap in Zambia given the logistical, material and travel expenses individuals have to meet before they can be known through out the constituencies. Indeed, no MP has won an election without going round their constituency unless nominated in which case do not represent any one as Kabimba is. At this stage candidates do not receive any salaries at all, except use of personal and their party’s election allocation resources. With given resources would be MPs go round the constituencies effectively and without complaints despite difficulties. That is selflessness fitting an MP. This is the kind of acceptable writing I want. Chipimo is learned. He never plagiarized any other person’s academic work to get a grade throughout his education. You can feel umundowendowe reading through this piece. He argues his points with familiar phenomena and simplicity. He has laid bare the MPs demanding increment in their perks. Any reasonable human being can clearly see from this exposure that Namugala and a bunch of other gluttonous MPs are not genuine in their demand. They are selfish. They want to eat alone the national cake. In fact their demand borders on extortion and theft. By Zambian standards the money they get is already enough. If they want let them strike. We are more that ready to descend on parliament and take up their seats with confidence. @mushota. Learn to write love not hate. Let’s call spared a spared. If ba SATA is not seen anywhere for two months why should we say it’s fine when not. The president makes headlines every day both on TV and radio. But tell us where is our president not PF president? We ar stupid zambians. UK MPs do not have all the luxury where there is more civility, rule of law and accountability than in Zambia. What is the point of driving a luxury car on a dirty pot holed road?, except that government priority should be to make better roads and homely residential areas. The assertion of salary increment for current MPs need to be discarded with shame of failure to improve the majority Zambians standard of living that demean our freedom of independence for 50 years. The next will be to deal with extravagant and huge presidential expenses of retirement. We need to claw back resources from one person to benefit the majority of Zambians still living in poverty and suffering lacking good medical provision. Interesting read in today’s post. The Editorial from Fred Mmembe is in praise of Sata and PF and is calling upon Zambians to support them. This is the second time am hearing this from him. Why is he being so openly blatant about where his loyalties lie? Why has he thrown off the cloak of pretence with regards objectivity? This to me are signs of panic. Something big is in the works. Something big is about to go down and little Freddy is quite afraid. I find it unbelievable that with such above avaerage salary in Zambia, MP’s still want an increment in their pay. I am not privy to the running of their constituencies, but I guess they do get some allowances for running a constituency office. I wonder how many of these MP’s have any admin staff or employ an assistance. Surely with that amount of fuel allowance, an assisance can engage the constituents alot more consistently while the MP is attending to parliamentary matters. Namugala et al, are in it for the money and what they can benefit from the system. To think that the government can find money to pay MP’s and find it impossible to reduce the pension backlog smacks of selfishness. On the whole this is an attempt to highlight the skewed discussion on MP pay increment. Look at their benefit alone, $65,000 loan for a duty free car. These people get paid on time. They have expenses etc. STOP this nonsense really. If you can’t cope leave these jobs! Find something else to do. Campaign instead that ordinary people have the right to be paid at the end of each month on time or else they should have extra monetary compensation for late pay. Also MP’s can carry on in private business. To make up their personal benefits. We are tired of Zambian gov’t and it’s self enrichment programme. You are servants of the people. So there is mana in Parliament!!! No wonder some civil servants who know what goes on to politicians pay themselves illegally!!! They reap so much at the expense of tax payers. You can work in government for over 30 years just to get as pension what an MP can get in three years!! Unfair game on this earth!!!! bana mugala,do you know how much miners suffer when they retire?do you know how much they get as their benefits?twapapata ba mayo twafweniko what you get is enough.lekeni ifyabupuba imwe.